In my last article, I used the benefit of hindsight to draft what would have been the perfect 2018 fantasy team. Today, we’re going to be looking at things a little differently. Instead of trying to draft the best possible team, we’re going to draft the worst. In some cases, we may have just gotten unlucky with injuries, but in other cases, perhaps we should have known a certain player would have been a complete and utter bust. 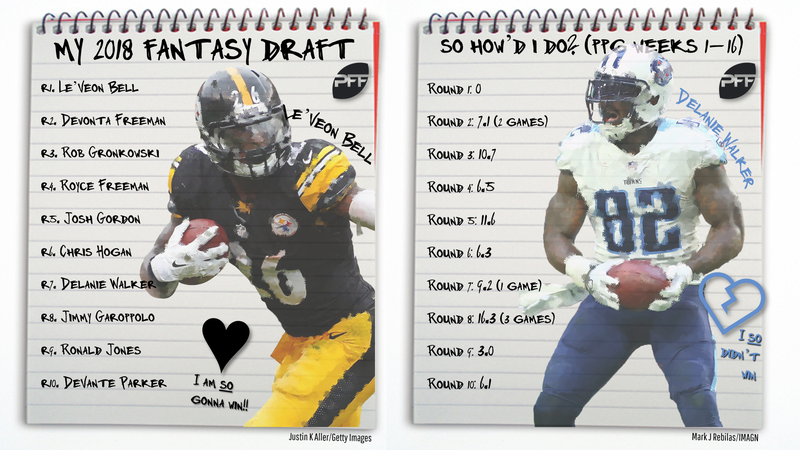 With these charts as our guide, today we’re going to be looking at ADP from August and attempt to piece together (trying not to reach more than a full round on any single player) what the worst possible draft would have looked like, and whether these selections were poor choices in hindsight. Easily the worst pick you could have made in the entire draft was selecting Bell, and especially at his lofty 1.02 ADP. There was a legitimate risk, but unfortunately no one (myself included) was calculating into his ADP, that he might sit out for the entirety of the season. He held out of camp in 2017 and came back in time for the season, so no one took that threat seriously this time. This was, obviously, a mistake. If you didn’t also have James Conner on your team, it’s hard to imagine you had a profitable season. After finishing first, 10th, and 13th among running backs in total fantasy points over the previous three seasons, Freeman ranked 100th in 2018. No. Freeman played in just two games all year, getting hurt in both games. In fantasy football, luck plays a massive role in our success or failure, and, in this instance, you just got hosed. Since his breakout season in 2011, Gronkowski has averaged between 17.5 and 20.0 fantasy points per game in six of eight fantasy seasons (Weeks 1-16). He averaged only 12.1 in an injury-plagued 2016 season. 2018, however, was his worst yet, averaging only 10.6. He wasn’t just less effective from a fantasy perspective, he also just recorded the lowest PFF grade of his career, and his first season since 2011 failing to earn an elite grade. Maybe. Gronkowski has always struggled to stay healthy and has clearly taken a lot of serious hits throughout his career. Although he always rewarded his drafters before (at least on a per-game basis), it seems those injuries have finally caught up to him. It wouldn’t shock me if Gronkowski retires after this season. 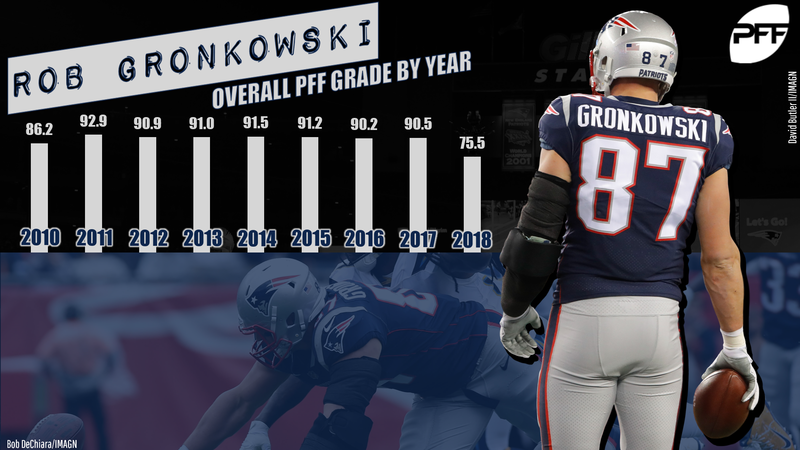 Someone once said, “It’s better to be a year early than a year late.” If you avoided Gronkowski this year for that reason, I’d bet you were right on time. Freeman was typically drafted as a mid-range RB2, while Phillip Lindsay was nowhere on our radar. Freeman ultimately finished as a RB5, while Lindsay finished 12th overall and 139.8 fantasy points ahead of Freeman. Should we have seen Lindsay have a breakout season? I think not – Lindsay was an undrafted free agent with little surrounding hype who had just 17 touches in the preseason. Should we have avoided Freeman at his ADP? I think so. I thought Freeman would be the team’s primary early-down running back (as the team had said shortly after drafting him), but a full bell-cow workload seemed unlikely, and Denver’s offense wasn’t one to be particularly excited about. Freeman was good in college but was far from a sure thing. In 2013, at age 22, playing in just 14 games, Gordon totaled the 14th-most receiving yards by any player in any season all-time. Since then, he’s averaged just 4.4 games active per year. Whether you drafted Gordon in the offseason despite him going MIA for the majority of training camp, or you traded for him after landing with the Patriots (as I, regretfully, suggested), drooling at his potential with Tom Brady under center, you knew there was significant risk involved. Gordon was about as boom-or-bust of a pick you could have made at the time, and just like in each of the past five seasons, this year, he was a bust. He averaged 12.5 fantasy points per game over his last 10 games with the Patriots – which would have been mid-range WR3 numbers if over the full season – but was ultimately suspended again, this time right before your championship week. Hogan averaged 12.2 fantasy points per game in 2017 but saw that number shrink to just 6.6 in 2018. Maybe we should have, but, in my own leagues, I did not. Though, maybe I should have taken my own words of caution more seriously. 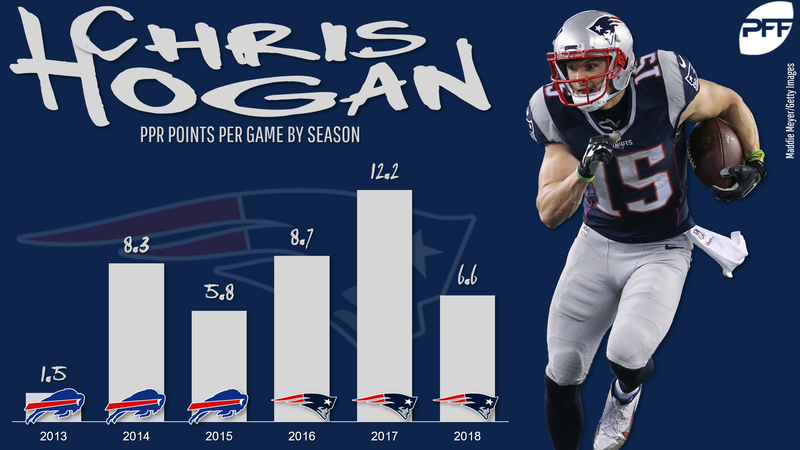 Hogan was productive in 2017 but did see a large bulk of his production coming from the slot and without Julian Edelman on the field all year. Furthermore, though he was productive that year, he graded poorly, ranking just 75th of 117 qualifying wide receivers in PFF receiving grade. Despite typically hyping up Hogan whenever mentioning his name, I did warn drafters of this fact here. Walker totaled just 9.2 fantasy points all year. Of course, he also played in only one game, before leaving with a season-ending injury. Across the previous four seasons, he finished sixth, sixth, third, and seventh among tight ends in fantasy points per game. Nope, you just got really unlucky. After making Garoppolo the fourth-highest-paid quarterback in the league this offseason, the 49ers would get just three starts from him before he tore his ACL in Week 3. 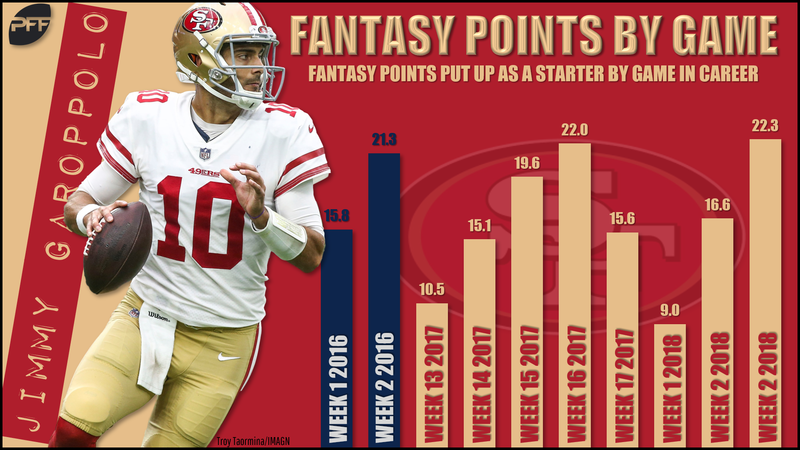 Across eight career starts with the 49ers, Garoppolo averages 17.1 fantasy points per start, which would have ranked as low-end QB2 numbers this year. If he kept up that pace, he might have been a bust either way, but the injury, at least, is not your fault. Jones and Peyton Barber had a 2018 ADP within two picks of each other. Barber would ultimately finish as a mid-range RB4, averaging 9.4 fantasy points per game, while Jones totaled just 20.7 fantasy points in nine games active. Yes, I think so, and the reason why highlights the importance of paying close attention to preseason usage and efficiency. Jones was disastrous this preseason, rushing for 22 yards on 28 attempts (0.78 yards per carry) and dropping two of his three targets. Meanwhile, Barber played on 33 of the team’s 50 (66%) first-team snaps this preseason, while averaging a more respectable 4.1 yards per carry. Parker played in 11 games this year, reaching double-digit fantasy points only twice. Probably. As was the case in every season of his career, Parker again suffered multiple injuries and failed beat his ADP, despite an entire offseason of heavy praise from the coaching staff. Perhaps a year away from Adam Gase or one of full health can revive his career, but as it stands he’s looking like a bust as a former first-round pick.